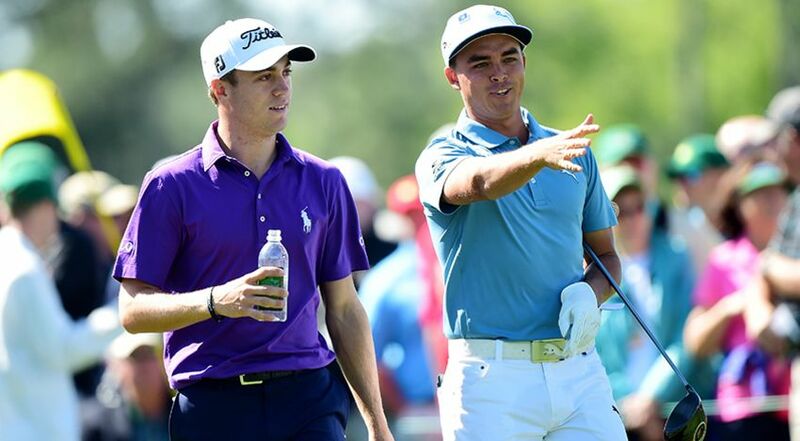 Roommates Rickie Fowler and Justin Thomas opened with 64s on Thursday. Typically they don’t care much who is leading the golf tournament out there in Phoenix. Simply doesn’t matter — anyone need a refill on that cocktail? Well, just to add a little sizzle to the party at the Phoenix Open, two of the field’s biggest names are sitting right there at the top of the leaderboard after Thursday’s first round. Justin Thomas is the highest-ranked player in the field, checking in at No. 4 this week while Rickie Fowler is No. 1 in the fan-love surveys — everyone loves Rickie — if you don’t believe that, just look at the commercials. Both have sniffed victory at TPC Scottsdale but haven’t closed the deal. “I’ve had a lot of success here,” Rickie quickly pointed out after his opening round. “I’ve played well here, still getting used to the new golf ball,” he said, referring to his switch to the TaylorMade TP-5 ball and there’s already a Rickie commercial for that. Rickie’s sharing accommodations with J,T. this week and the two combing to go 14-under, probably served up some interesting dinner conversation. J.T. is one of those players who can get surgical with his iron shots and he was on the number early in the day. “The thing about this course, I haven’t played it that great, even though I like it tee to green,” said Thomas, who has two top-20s but also a pair of missed cuts in four Phoenix starts. “I feel like it suits my game, but I just have kind of have had a round here or there and a couple holes. And you just have to stay patient because you can get on a pretty good roll out here. Late in the day, J.T. and Rickie had company at the top of the scoreboard. Harold Varner III saw the huge crowd at the par three 16th erupt when he holed a 32-footer for birdie to get seven-under for the day. He had a chance for the solo lead when he drove the green at the short, difficult par four 17th but couldn’t get his approach putt close enough to convert the birdie. Varner was all smiles afterward. “Everyone wants to be loved and you get a lot of love out here,” Varner said of the record-setting crowds. Things will only get larger and louder over the final three rounds. Last year the gallery total pushed north of 790,000 for the week.